This article originally appeared in the November/December 2017 issue of FAA Safety Briefing. It has been republished here with permission. Whether you're a baby-boomer aviator or a millennial pilot-in-training, chances are you’ve spent some quality time at flight level “0” learning how to be a better pilot. I’m referring to flight simulation devices which, from the very dawn of aviation, have been instrumental in helping pilots hone their flying skills, practice the impracticable, and attain an intimate familiarity with their aircraft — all without the high costs or risks associated with flying. The benefits are undeniable, which is why the FAA is working to help more airmen benefit from this safety enhancing technology. Look no further than the FAA’s revised regulations on the topic in recent years. In addition to providing some welcome flexibility on training allowances towards certification, revisions have introduced us to a new and more logical lexicon for categorizing these flight training devices. 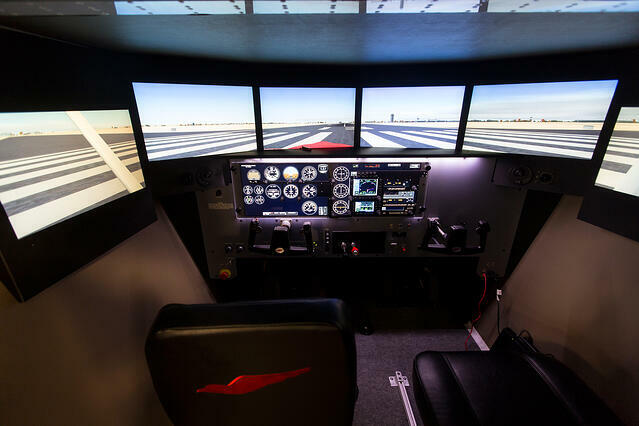 The FAA categorizes aviation ground trainers into three main categories: full flight simulators, flight training devices, and aviation training devices. This article will focus on the latter category, as they are the most directly applicable to the general aviation training environment. However, having a general understanding of the former two categories is also important to have a more complete picture of the role of flight simulation training, especially if you plan to pursue more advanced training or have your eye on getting a type rating. FFS: We’ll start first with the heavy hitters: flight simulators — or more accurately — full flight simulators (FFS). These more capable (and more expensive) training devices are required to have motion and visual capabilities. FFSs are sub-categorized into four levels, A through D, with Level D being the most sophisticated and having the most requirements, including six degrees of motion and realistic cockpit sounds. All levels of FFSs are objectively evaluated against airplane specific validation data (typically aircraft flight test data) to ensure that the FFS’s aerodynamics, flight controls characteristics, and ground handling characteristics represent a specific make, model, and series of aircraft. An FFS is often a “type” specific platform. It’s because of this that pilots can use a FFS to earn a type-rating without flying the actual aircraft. Many FAA-approved part 142 training centers use FFSs to train professional pilots for type ratings and to deliver the recurrency training required by regulation and insurance companies. FTD: The next category is flight training devices, or FTDs. These devices are designed to represent a specific aircraft configuration and, depending upon the FTD’s qualification level, may include an enclosed cockpit and realistic visual references. They are not always motion capable, but are sophisticated enough to provide training in preparation for commercial and airline transport pilot certificates, as well as other ratings. You can find specifics on these allowances in figure 1 below. 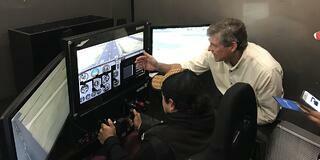 FTDs are very popular with aviation-oriented universities and colleges. The airline industry also uses these devices extensively to train new hires or provide for upgrades (First Officer to Captain) and transition training (e.g., B-737 to B-747 aircraft), or for recurrency training. FTDs are sub-categorized into Levels 4 through 7. Levels 4, 5, and 6 apply to fixed wing devices, while Level 7 applies to helicopters. Incidentally, Levels 1 through 3 apply to older devices that are either no longer supported, grandfathered, or were recategorized elsewhere (some become ATDs, which we’ll cover next). 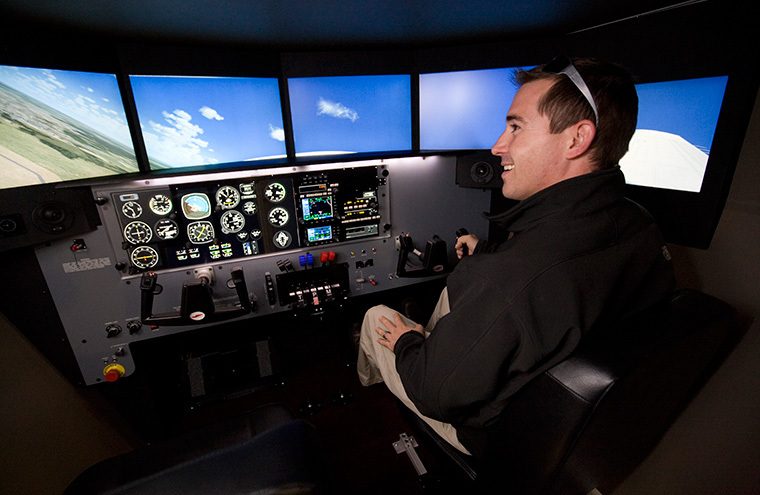 Please note that Full Flight Simulators and FTDs (collectively called Flight Simulation Training Devices – FSTDs) come under the guidance, evaluation, and approval of the FAA’s National Simulator Program (NSP) in Atlanta and are regulated under 14 CFR part 60, Flight Simulation Training Device Initial and Continuing Qualification and Use. For more on the NSP, see the article “Better than Real” on page 20 of the Sep/Oct 2011 issue of FAA Safety Briefing at go.usa.gov/xRt5g. That brings us to our final category, the Aviation Training Device or ATD, which is by far the most common option for GA flight training. 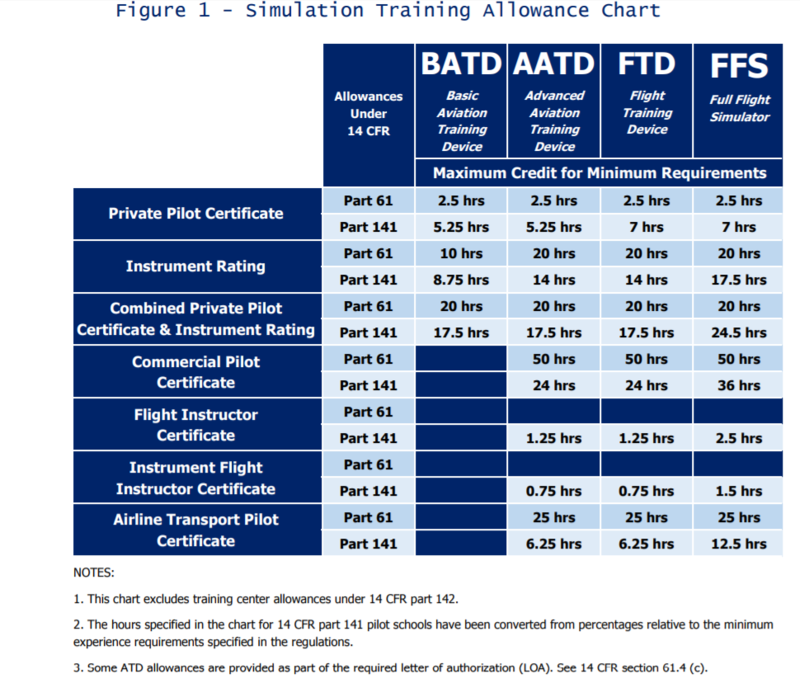 In 2008, the FAA adopted Advisory Circular (AC) 61-136, FAA Approval of Aviation Training Devices and Their Use for Training and Experience, which helped reclassify and redefine standards for what were previously Level 1-3 FTDs and personal computer ATDs (PCATDs). The AC did so by introducing two new terms, the Basic ATD (BATD) and the Advanced ATD (AATD), along with providing corresponding performance standards and user guidelines. The AC also describes that policy and approvals for ATDs resides with the FAA’s General Aviation and Commercial Division and provides a clear outline of how these devices are to be evaluated and approved. A self-centering displacement yoke or control stick that allows continuous adjustment of pitch and bank. Self-centering rudder pedals that allow continuous adjustment of yaw and corresponding reaction in heading and roll. Throttle or power control(s) that allows continuous movement from idle to full-power settings and corresponding changes in pitch and yaw, as applicable. Mixture/condition, propeller, and throttle/ power control(s) as applicable to the aircraft represented. Controls for certain items that are applicable to the category and class of aircraft represented, like wing and cowl flaps, gear handle, pitch trim, etc. In addition, pilots must be able to see, feel, and operate the controls for all the previously mentioned equipment in the same manner as they would in the actual aircraft, including the switches and indicators on the instrument panel. Control input responses must also be similar to real-life and are not allowed to appear to lag in any way. If the BATD is using electronic displays, it must render images that are clearly legible and don’t appear to jump or lag relative to a control input. In a nutshell, then, all displays and controls in the BATD must reflect the dynamic behavior of an actual aircraft. For example, if you change the flap setting, or the cyclic control, the appropriate changes in flight dynamics must be registered and reflected on all of the applicable displays and indicators in the BATD similar to how that actual aircraft would respond. Even the aircraft performance parameters (e.g., cruise speed, stall speed, max climb rate, etc.,) must be comparable to the representative aircraft. It may seem like a tall order to meet these requirements, but the good news is that today’s high-end and relatively low-cost computer options are usually more than capable of providing the processing horsepower needed to meet these demands. AATD: As its name implies, you’ll notice that there are higher standards for Advanced ATDs, along with design criteria that call for a more realistic aircraft look-and-feel. First off, an AATD must meet all BATD-approval criteria, as well as incorporate additional features and systems fidelity that significantly exceed that of a BATD. Among those provisions include incorporating ergonomics “representative” of a category and class of aircraft flight deck, a GPS system with moving map display, a two-axis autopilot (if standard equipment), an independent visual system capable of rendering realistic VFR and IFR conditions, a separate instructor station, and the ability to simulate all emergency procedures that have a checklist in the POH or flight manual. To receive this LOA, all ATDs must go through a rigorous approval process. It starts with developing what’s known as an approved Qualification and Approval Guide or QAG. This QAG document serves as the basis for approval and includes a detailed description of all components, functions, capabilities, and possible configurations for the training device. A manufacturer requesting an ATD approval will send this QAG along with a request letter to the FAA. If both are found acceptable and pass an initial audit, the FAA will then schedule and conduct an onsite operational evaluation of the device. If the ATD passes, the FAA will issue the LOA and an approved QAG to the manufacturer. If a manufacturer later modifies an approved ATD, a revised QAG must be resubmitted for approval. Recognizing that technology continues to evolve and improve, the FAA is constantly on the lookout for ways to permit increased usage of ATDs in GA pilot training. Just last year a regulation change increased the maximum time that may be credited in an ATD toward experience requirements for an instrument rating under part 61 (20 hours for AATD and 10 for BATD) and provided an allowance of 25 percent and 40 percent of creditable time for BATDs and AATDs respectively toward an instrument rating under part 141. This revision also eliminated the need to wear a view-limiting device when logging instrument time in an ATD. With another new rulemaking effort in the works, expected in December 2017, the FAA proposes to allow pilots to accomplish instrument currency pilot time in a FFS, FTD, or ATD without an instructor present to verify the time, as well as allow ATD time to accomplish instrument currency requirements to be identical to the tasks and requirements described for an aircraft, FFS, or FTD. Currently, pilots using an ATD to accomplish IFR experience (currency) requirements must perform additional tasks and must log three hours of time in addition to performing six approaches, holds, and intercepts within the previous two months before a flight as required under 14 CFR section 61.57 (c)(3). To see the proposed rule, go to go.usa.gov/xRt5Q. Note: the final rule mentioned above went into effect in 2018. You can view it here and read what it means for ATDs here. Related Content: Can the 3 Hours of Instrument Time Required for PPL be Done in a Simulator? To help illustrate this point, let’s say you need 35 hours of flight training under a part 141 school to get a private pilot certificate. You can get credit for 5.25 of those 35 hours in a BATD. But let’s say you go beyond that. Maybe you even log 35 hours in the BATD. That might seem like a lot, but that extra time in a lower cost ground trainer may actually help you stay on target with the remaining 29.75 flight hours required. So even if you wound up having 35 hours of aircraft time and 35 hours of BATD time, that’s still way less total flight time (and cost) than what the average student pilot acquires while pursuing a private certificate — which is about 75 hours. Another up-and-coming area for ATD and FSTD technology is virtual reality, boasting much broader visuals and 3-D imaging. Evidence of VR’s growing popularity can be found at events like FlightSimCon, which at this year’s convention in Hartford, Conn., touted several trainers using VR goggles. While integrating VR technology into an approved ATD is still a ways off, its potential is extremely exciting for the industry. Whether you’re an aviation novice, or experienced veteran, here’s the bottom line: Using aviation training devices is effective, efficient, and provides pilots and instructors with a superior learning and training environment. But more importantly, these instruments are proving themselves to be true catalysts for a safer NAS. If you have questions on ATD regulations, policy, or guidance, or if you seek to incorporate an ATD into your flight training program, please read AC 61-136A and, as needed, contact your local Flight Standards Office for further assistance.